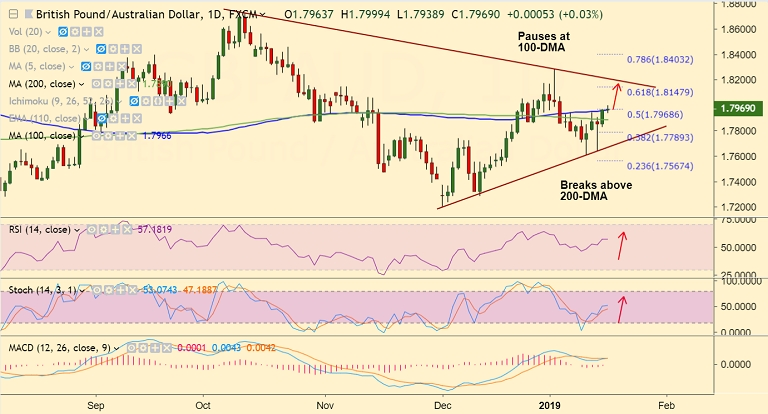 GBP/AUD trades in a narrow range, Doji formation seen on daily charts. Sterling remains at the mercy of Brexit-focused headlines, uncertainty to keep gains limited. Following a blowout defeat in the House of Commons earlier this week, Theresa May succeeded in surviving yet another no-confidence vote. However, Sterling showed little change post the confidence vote. The pair trades with a positive technical stance, has broken past 200-DMA resistance. Breakout at 100-DMA will see further upside in the pair. Next bull target lies at 61.8% Fib at 1.8147 ahead of trendline resistance at 1.82.